My highlight of our trip to the UK in 2006 was a visit to the North Wales town with the longest place name in Britain. That’s me at Llanfairpwllgwyngyllgogerychwyrndrobwllllantysiliogogogoch Station. I’ve wanted to write a poem about it since penning one about Lake Chargoggagoggmanchauggagogchaubunagunggamaugg, the longest place name in the US. That one took me four months. The Welsh poem turned musical when I realised that the name could be made to scan with a beautiful Welsh folk song we used to sing at Hutt Intermediate. The church of Mary in the hollow of the white hazel near the rapid whirlpool and the church of Tysilio by the red cave. My best guess from 12,000 miles away is that gogo is a fusion of go (by) and ogo (cave). Can anyone verify this? 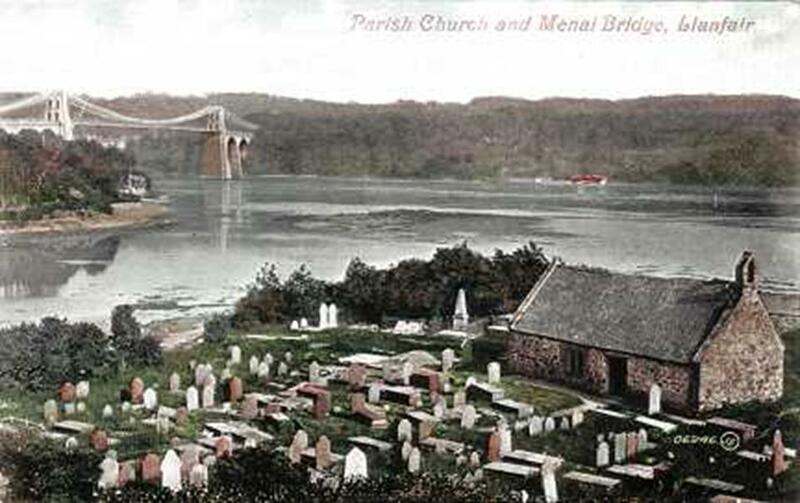 As St Mary’s would have looked in the 19th century when the town’s name was lengthened from Llanfairpwllgwyngyll as a publicity stunt. Surely the longest car dealership sign in the world. The village is a signwriter’s paradise. One day I hope to sing the song there – via a poetry recital at Lake Chargoggagoggmanchaugaggogchaubunagunggamaugg. For now, I must figure out how to make a You Tube of the song. If the NZ Poetry Society folk don’t mind me extending the definition of poetry a tad, I’ll sneak it into my guest spot at the Thistle Inn on Monday 15 February. Previous postIs this the climate fraud tipping point? There is already a song about Taumatawhaka……….. It was recorded in the late 50’s or early 60’s by Rod Derrett of Kiwi Express and Taumarunui On the Main Trunk Line fame. I grew up at Mangaorapa and lived about 5 or 6 miles past the sign that was on the road. Not far from Te Awa Putahi (or Taputai as it is known locally). In their wisdom the fools on the CHB District Council moved the sign to the Porangahau/Wimbledon Road 10/15 years ago and took the old sign on the Mangaorapa Road down – only they would know why as the new sign is a different format and there seems no reason not to have a sign on each road. After all it is the same hill from either side. JA: Are you sure those songs weren’t by Peter Cape? I know his daughter and could have sworn they were his. Having been to both sites (Llanfair PG and Taumata…), I couldn’t help but notice how much the Welsh make of their long name and how little New Zealand makes of its longer one. In Llanfair PG there’s a whole tourist centre next to the station where tour buses pull up and you can buy all manner of souvenirs. At Taumata…, there’s nothing but the sign – and another rather unimaginative sign further up the road pointing the way to ‘Historic Name’. The irony is that the Welsh name was made up to attract tourists, while our name is genuine, with no attempt made to attract them. Now admittedly the Hawkes Bay sign is a long way off the beaten track, but I remember it as a beautiful drive past some spectacular stands of poplars. You’d think that an imaginative council could find ways to exploit their linguistic treasure – particularly in tandem with the nearby Wimbledon! While a number of people have recorded the songs noted by pdm, the authorship is Peter Cape’s with assistance from Don Toms with the music notation. This is recorded in the book ‘No Ordinary Joker’ by Roger Steele and is confirmed to me by Stephanie Drew, Peter Cape’s daughter (and my wife). Thanks Peter. Certainly all the internet references support this view. I have no idea who wrote them but am fairly sure Rod Derrett sang them. Googling the subject, I notice that Rod Derrett sang the famous Puha and Pakeha. Could it be that he also did Taumata… at some stage as a cover version of Peter Cape’s original? Hi there, yes, I had the Peter Cape record (which my late mother gave to Welsh friends in Flint, North Wales) Wish I had kept it! It went like:- “He was standing on a hill top playing his flute, cooler than Goodman, boy he was beaut, and the song that he sang in between each toot was Taumata whaka tangi hanga kououau, tamatea pokai, whenua kitana tahu! !” went on like, “now I farm a station up in south Hawke’s Bay etc.” Regards, Marie. P.S. Had my first and probably last visit to the UK June-Aug 2009 and was thrilled to actually stand on the station of Llanfair P.G. My grandmother was born in Flint in 1881 so was a wonderful visit – also to hear the Trelawnyd choir – tears and more tears! ’nuff said! (From off-stage:) What’s that mate? Thanks for that Graeme. From memory the Maori pronunciation was somewhat Anglified too – moreso than would be allowed today. I clearly remember learning this song at school in Hamilton, NZ. I remember all the words and the tune. Loved it! !